A low-carbon electricity standard (LCES) would serve us better than a cap-and-trade program or renewable energy standard (RES), according to Khosla. I recently wrote an op-ed in the Washington Post about the deficiencies of an isolated cap-and-trade or carbon-pricing bill, and the vital importance of promoting technology-neutral "carbon-reduction capacity building" through a low-carbon electricity standard, low-carbon fuel standard and aggressive efficiency standards. I argued these policies would cost the least in the long run, foster American jobs, create new 'Googles' in the energy sector and drive development of radically low-carbon technologies. Furthermore, I asserted that developing countries would willingly adopt these technologies because of the competitive advantages provided by the efficiency and economics. Op-eds offer a limited platform for discussion, so I've decided to take the opportunity provided by Greentech Media, unconstrained by word count, to expand my position, specifically in relation to low-carbon electricity, explaining not just why a cap is a bad approach, but also addressing why a renewable energy standard (RES) is inadequate. In order to determine what type of legislation is best, we need to establish exactly what problem we're trying to solve. If it's how the U.S. can decrease its carbon emissions the fastest in the near term (e.g., 17 percent by 2020), then the answer may well be a utility carbon cap with the appropriate targets. However, I think the far more important goals for any legislation are how we (1) develop the technology and capacity to reduce carbon emissions rapidly and radically, (2) realize our goal of economically reducing the world's emissions by 80 percent by 2050 or earlier, and (3) ensure that the U.S. leads the way in clean technology innovation and implementation. In short, how can we legislate to address the challenges of both the environment and the economy? Let's first think through the effects of a utility-only carbon cap like the one currently being discussed in Washington, D.C. In order to comply, utilities will pursue small incremental changes in efficiency and emissions. For example, a utility can achieve virtually all of the carbon reduction goals slated for 2020 by closing their oldest coal plants, upgrading a few burners to more efficient ones, repowering some coal plants with natural gas, and increasing the capacity factor of existing or new natural gas plants. There's nothing wrong with pursuing efficiency or shutting down old coal plants, but all of these actions do nothing for the development of next-generation, ultra-low-carbon technology. By having legislation that gives utilities tacit support that what they're doing is enough, we will delay next-generation, ultra-low-carbon technologies, hurting our carbon reduction capability. After all, it will be almost impossible to commercialize next-generation low-carbon technologies if there is no domestic demand. If utilities become less interested in immediate deployment of radically lower carbon technologies, then venture capitalists and corporations will be less interested in deploying capital in America for low-carbon technology. This trend could lead to the suffocation of American clean energy innovation. Still, let's say that we as a country continue to play the incremental game for a while, achieving 15 percent to 17 percent carbon reduction over the next decade without developing any fundamentally new technology. In the meantime, India, China and the rest of the developing world will (conservatively) double their emissions, thus making our reductions irrelevant. More problematically, we will not be any more prepared for achieving the greater challenge of the next 65 percent of reductions, nor will we be ready should we need to dramatically accelerate carbon reduction in the face of new climate information (non-linear systems are notoriously hard to predict). If we want to make a significant difference, we need to get on the path to reducing carbon worldwide by 80 percent now by focusing on what I call 'carbon reduction capacity building' -- in other words, we need to develop radical carbon-reduction technologies. A utility cap (or a carbon price) won't build capacity -- it will just increase our utility costs and decrease our manufacturing competitiveness without any increase in our technological competitiveness. On the other hand, although a policy that promotes capacity building will increase research investments in the short term, it will likely decrease overall electricity costs in the medium to long run (through the magic of competition, technology and regulatory certainty), while simultaneously reducing carbon. Disruptive technologies require investment; they don't come from the status quo. I mentioned carbon reduction capacity building in the op-ed, using Craig Venter's sequencing of the human genome faster and more cheaply than the Human Genome Project (HGP) as an analogy. Instead of focusing on gene sequencing, Venter focused on developing technology for rapid sequencing. While the government HGP project labored on sequencing for more than a decade, once Venter developed his new technology, he sequenced the genome in about three years. And he was also much better positioned to sequence the next genome. The concept is quite simple: by spending a few years developing radically low-carbon technologies upfront (i.e., engaging in "carbon-reduction capacity building"), we can front-load the development process, so when we begin to deploy the technologies at scale, we achieve radical emissions reductions more quickly and at less cost than we would by plugging away at incremental techniques. This parallels what happened when Venter finally deployed his techniques for sequencing; his team was able to achieve with $300M and three years what the HGP was struggling to do with $3B and 10 years. In addition to the cost and time savings, we can export these technologies, win the low-carbon race and create jobs... and not only that -- the sooner we develop these technologies, the earlier we will have them available as climate insurance. Most current legislation is not geared to achieve these goals. To achieve carbon-reduction capacity building, many people have proposed a renewable energy standard (RES). However, by carving out a large percentage of generation as "renewables" for renewables' sake, an RES does not create an environment where carbon capture and sequestration (CCS) has to compete with solar for market share. Though we would provide a protected market for renewables (and we at Khosla Ventures have far more invested in qualifying "renewables" than in CCS), we may miss the only opportunity we have to create competitive pressure and urgency among CCS technology developers and users. Consumers would pay more, and the reduced competition would hurt global carbon reduction by slowing the development of technologies like CCS. Under a "low-carbon electricity standard" (LCES), each state can pick the most appropriate technologies -- perhaps solar for Arizona, wind for Texas , biomass in Arkansas and CCS for Indiana. States with inadequate renewable resources will be able to deploy CCS, advanced nuclear, or low-carbon natural gas through CCS or hybridizing with solar, or anything new that technologists may invent, rather than just purchasing out-of-state RECs. I want to stress that last point, because I believe if there is one technology that needs to be developed immediately, it is CCS. In my view, it is the single most important thing we can do to achieve global carbon reduction. Without CCS, independent of what we do in wind, solar, biofuels and nuclear, global carbon reduction of any significant degree will be impossible. For reference, an additional 0.3 billion tons of coal consumption (about one billion tons of carbon dioxide emissions) is likely to come online each year for the next several years, wiping out all potential gains from the United States' adoption of solar and wind (U.S. coal consumption is around 1.2B tons/year). And the only way to get CCS moving is to require it to compete in a low-carbon marketplace. To date, all the utilities have professed a strong interest in developing CCS, but when questioned in detail, the answer is invariably "at some future time, with someone else's money..."
Currently, there is no competitive pressure for the rapid development of CCS. Though there are several projects, such as AEP's Mountaineer, and some enhanced oil recovery (EOR) projects, few seem serious. Frankly, I believe, aside from the EOR projects, most of the rest are marketing programs rather than real technology development efforts. And EOR will only encourage supercritical carbon dioxide separation. We should be open to all possible ways to provide low-carbon electricity. With all of this in mind, let's consider the possibility of implementing a low-carbon electricity standard (LCES), which sets a goal of 20 percent of electricity from low-carbon sources (higher than the current 15 percent in Senator Bingaman's RES) country-wide by 2020. We could potentially even reserve 75 percent of this goal for "renewable sources" for the first seven years (in addition to incentives like ITC for newer technologies) to satisfy the environmental groups and allow for newer technologies to move further down the cost curve. This is justified because nuclear has had its share of subsidies and has still matured 'down' the cost curve. This hypothetical standard would allow any new technology that achieves at least 80 percent lower lifecycle carbon than a coal plant (or approximately "full lifecycle" 500 lbs. of carbon emission per MW-hour of electricity). It would include renewables, CCS, newly deployed nuclear or any other ultra-low-carbon source that has not yet been conceived. I'm not pretending to have invented this idea; it has been proposed by numerous senators and policymakers over the years. A LCES opens up the playing field, creating a situation where each state can react uniquely to achieving low-carbon electricity, and each technology has to compete on cost to win. Rather than trying to achieve specific total carbon reductions by 2020, this policy would foster a laser-like focus on carbon-reduction capacity building -- and the deployment of innovative technologies that can change the world. Why do I believe all this technology-neutral capacity building is necessary? Right now, we don't have enough cost effective low-carbon technologies. Onshore wind is relatively inexpensive ($1,000-2,000 per kW), but is only applicable in some states. Some other cost-effective technologies, such as geothermal and hydro, work in limited areas. Solar is getting competitive, but offshore wind and CCS are untried, immature and more expensive than their high-carbon alternatives. And CCS is key to global carbon reduction. Without CCS in a race with solar and wind, we just get delays and empty words. Every time there is a carve-out for some technology or deployment method, a market is being warped, and suddenly the chosen technology doesn't need to compete and minimize cost in order to "win" (case in point, solar feed-in tariffs in Europe, and more recently, Oregon). Consumers lose and excluded technology development slows down. If we focus our efforts upfront on developing economic low-carbon technologies in a competitive marketplace, when push comes to shove, and there is pressure to deploy low-carbon technologies across the world, the lower costs we will have achieved will make it more likely for the developing world to adopt these technologies. Our goal should be for American innovation to reshape the global energy market in much the same way that we drove the computing, telecom and internet revolution. Imagine the 'Googles' of cleantech ensuring our own energy security, creating sustainable jobs and exporting advanced technologies. The U.S. would take the lead in the worldwide deployment of this new technology and knowledge. Ultimately, to reduce carbon intensity worldwide by 80+ percent, we have to have a diverse arsenal of ultra low-carbon technologies that are economic to deploy, as part of a more efficient economy, be they renewable, CCS or nuclear. No global treaty is going to convince China or India to do what they believe will constrain their growth and their ability to give their citizens a better life. However, in a world where the U.S. (or someone else, if we fail to) designs economic radical carbon reduction capacity technologies, the developing world will grow into highly efficient, low-carbon economies with no encouragement, because it will make simple economic sense. In fact, they would be at a competitive disadvantage not to deploy them. RES and carbon cap proponents fail to recognize that global adoption of low-carbon technologies is key and just having the U.S. meet some legislated goal will do little. For that, competition and new technologies beyond renewables are essential. In the end, these technologies will make up the Venter-like tool set we need more than any percentage reduction a utility cap offers us. We need a dozen flavors of carbon sequestration, just like we need a dozen flavors of renewables to broaden coverage and applicability of low-carbon solutions to most regions of the U.S. and the world. In order to reach that future more quickly, subsidies are a powerful force, but they should not be technology-specific. Each newly emerging ultra low-carbon technology should have access to the same PTCs and loan guarantees. After all, not every technology will work everywhere, but ultimately you want the most economic ones to win, every time. For example, many environmentalists are worried about the risks of nuclear power. I think that's irrational, but for my part, I seriously doubt that nuclear can compete by 2020 if other technologies had the same financing terms that nuclear loans guarantee. Many proponents of nuclear disagree on its competitiveness, but it does not matter; if the regulations were in place, the market would decide. Anything could qualify, from solar thermal to an old coal plant retrofitted with CCS. Our country has a patchwork of constantly expiring subsidies and state-level legislation with numerous carve-outs for nuclear, solar, wind, utilities, independent developers and a whole host of other things. Let's treat mature low-carbon technologies like nuclear to the same financing terms (read: loan guarantees) as all of its competitors. For still-immature technologies (e.g., those with less than five percent to ten percent market share in the utility market), let's offer extra incentives like ITC and PTCs for seven years (after they start scaling) to offer them an opportunity to gain scale and get market competitive. In the end, it makes sense to follow in Venter's footsteps and develop a diverse array of carbon-reduction capacity, across all sectors that emit carbon, from electricity to agriculture. Each individual technology will need to be at least 80 percent better than current benchmarks. If we apply that metric to both supply-side energy production and demand-side energy consumption, that combination results in 96 percent lower emissions, or over 20 times the carbon productivity. With all of those pistons firing, you have a fighting chance of hitting an 80 percent total emissions reduction target by 2050, all while allowing for population growth and increased quality of life for billions of people. American technology can address this huge challenge, if only we unleash the power of entrepreneurial energy. In order to do so, we need a realistic legislative framework to provide certainty, support and the impetus to get us there. Khosla Ventures offers venture assistance, strategic advice and capital to entrepreneurs. The firm helps entrepreneurs extend the potential of their ideas in breakthrough scientific work in clean technology areas such as solar, battery, high-efficiency engines, lighting, greener materials like cement, glass and bio-refineries for energy and bioplastics, and other environmentally friendly technologies, as well as traditional venture areas like the Internet, computing, mobile and silicon technology arenas. 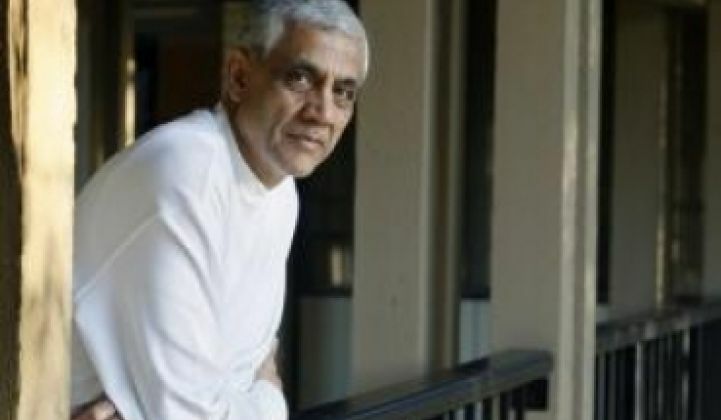 Vinod Khosla founded the firm in 2004 and was formerly a General Partner at Kleiner Perkins and founder of Sun Microsystems. Khosla Ventures is based in Menlo Park, California. You can read Mr. Khosla's previous piece, What Really Matters in Thin Film Solar Startups, here.